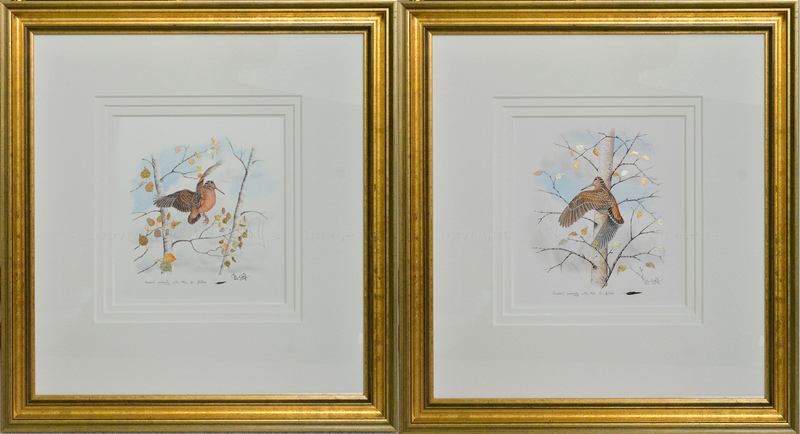 In the days after Christmas, Colin put the finishing touches to these two woodcock pin-feather paintings. Together they make a pair, because one is a Eurasian woodcock (Scolopax rusticola) and the other is an American woodcock (Scolopax minor). What makes them different from Colin’s other woodcock pin-feather paintings is the addition of a new element: gold leaf. Colin owes his inspiration to the work of a Romanian friend, Cornel Apostol, who is an iconographer (and a talented photographer). Encouraged by Cornel, Colin decided to experiment with different shades of gold, using the wafer-thin sheets to represent some of the leaves in the background of his pictures. The result incorporates four subtly different hues of gold: lemon, green, red and ‘moon‘, ranging from 16.5 to 24 carats. 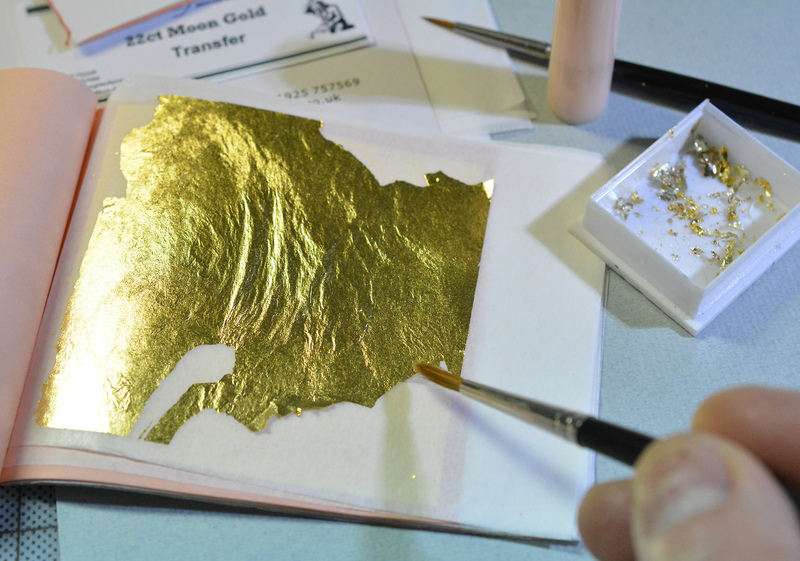 Fixing gold leaf to paper is a tricky process which involves applying a special size or glue to the surface, and then carefully placing the sheet of gold over the top. The area is then burnished and the excess gold is gently removed with a stiff brush. 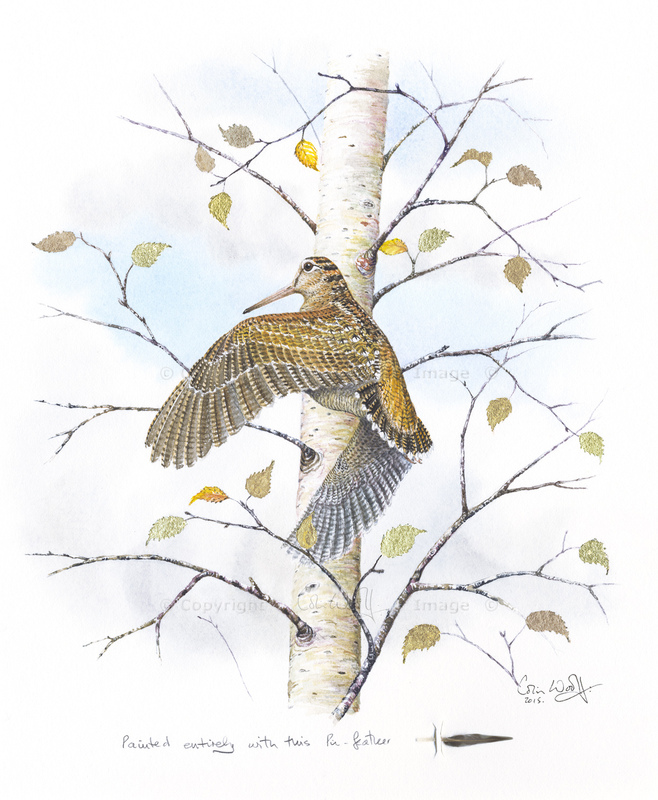 The paintings themselves depict Eurasian and American woodcock in flight; the Eurasian woodcock has a background of birch leaves, while the American woodcock is portrayed with aspen. Each has been painted with a single pin-feather from the respective bird, and the feather is inserted into the paper, below the image, before framing. 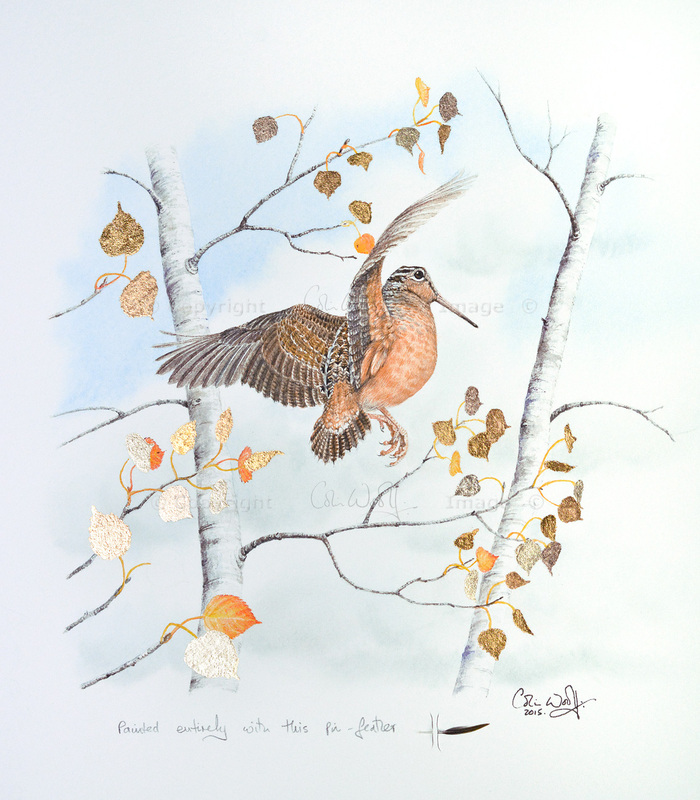 The American woodcock, also known as the ‘timberdoodle’, has a distinctive cinnamon-coloured breast and is considerably smaller than its Eurasian cousin. Its pin-feather is also proportionately smaller and tends to be much softer, which makes for a challenge of focus and skill in the hands of the artist. The paintings each measure 210 x 200 mm (image size) and are now being offered for sale. That is one incredibly talented husband you have there. These are wonderful! Thank you, Pat! 🙂 Yes, I know! Awe-inspiring beauty – Colin is such a talented and patient artist. How beautiful these are. Thank you both for your great website(s), inspiring photos and text, and paintings. I look forward to every new installment. Wow!! These pictures are truly amazing. What a talent and it must take a very steady hand when doing the gold leaf. The colours used compliment each other very well. Absolutely beautiful. Thank you, Moira! I know, they are stunning. It did need some patience for the gold leaf, you’re right! But it paid off in the end, and he’s very pleased with them.